The basics of taking care of your teeth include the following: brushing, flossing, and mouthwash. Some people accumulate plaque and tartar faster than others; for these patients we may recommend coming for an "inbetween" cleaning. Also, if you have orthodontic appliances, we can demonstrate different techniques using orthodontic specific tools to keep your teeth clean. Please follow the rule of 2's. Everyone should be brushing twice a day for two minutes each time. 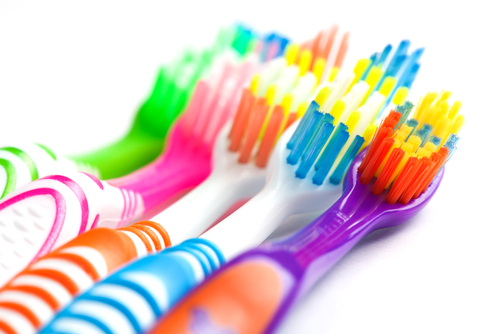 Make sure to brush all three surfaces of every tooth: front, back, and the chewing surface. While brushing the front and back, don't forget to angle the bristles of the toothbrush toward the gumline and move it around in small gentle circles. Toothpastes come in a variety of flavors as well as fluoride and fluoride free - ask your dentist what your child should be using! If two of your teeth are touching, you must floss in between them! Glide the floss below the contact point and scrape up against one side of the tooth and repeat, scraping up against the second side. Flossing should be done once a day in the evenings. It is common for younger children to have spaces between all their baby teeth - no flossing required! However, as one gets older, those spaces tend to close so beware and get ready to floss! Try the floss sticks, they're way easier! We recommend a fluoride mouthwash in the evenings right before bed. You swish it around in your mouth, spit it into the sink, and go straight to bed. No rinsing with water afterwards! We want a tiny amount of the fluoride mouthwash to stay on your teeth while you sleep. These mouthwashes come in a variety of flavors as well as alcohol and alcohol free.